If you’ve spent a lot of time around the Christmas dessert table, like I have, you may have noticed these pretty church windows. I’ve seen them at many a holiday gathering from work to family functions, but never realized exactly what was in them or how they were made. 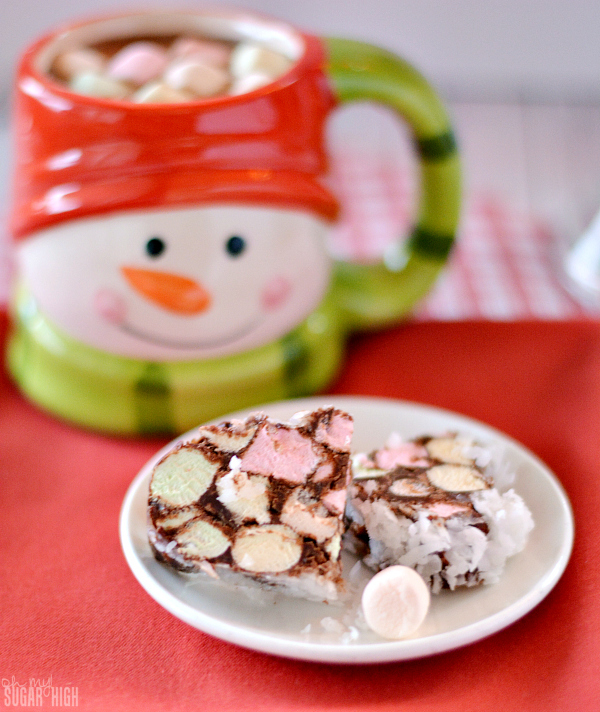 Now I don’t have to wonder because Kari Stroschein is sharing her secrets to making this rather easy Christmas treat! With just four ingredients and no baking required, this a perfect addition to your holiday treat list. 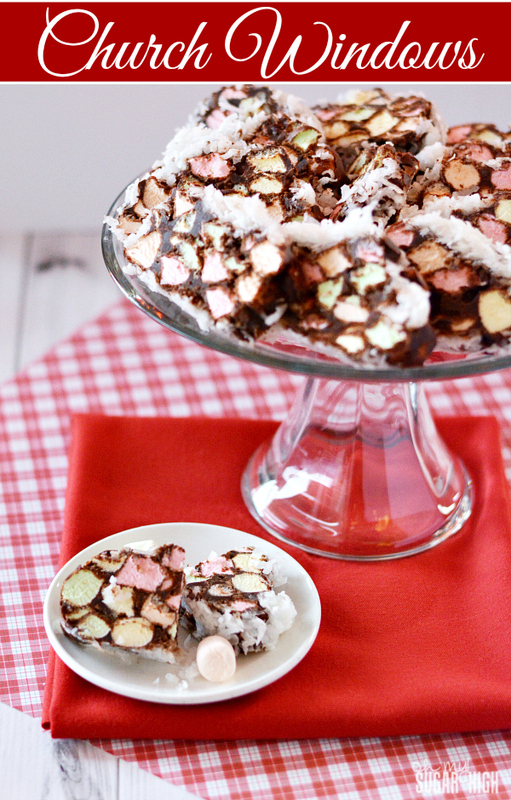 The colored marshmallows not only add additional flavor, they bring some color to any dessert platter. Have fun with this holiday treat classic! Making this no-bake holiday dessert may be easier than you think! Optional: Add 1 cup chopped walnuts in with the marshmallows. Another option is to make treats into bars, using a 9″x9″ square pan. Simply press chocolate, butter and marshmallow mixture into a greased pan, top with coconut and chill before cutting into bars. In a saucepan over medium heat, melt butter and chocolate chips while stirring constantly. Remove from heat and let pan cool for about five minutes. On two sheets of waxed paper, sprinkle coconut in the center. With marshmallows in a large bowl, cover in chocolate. Stir until completely coated. 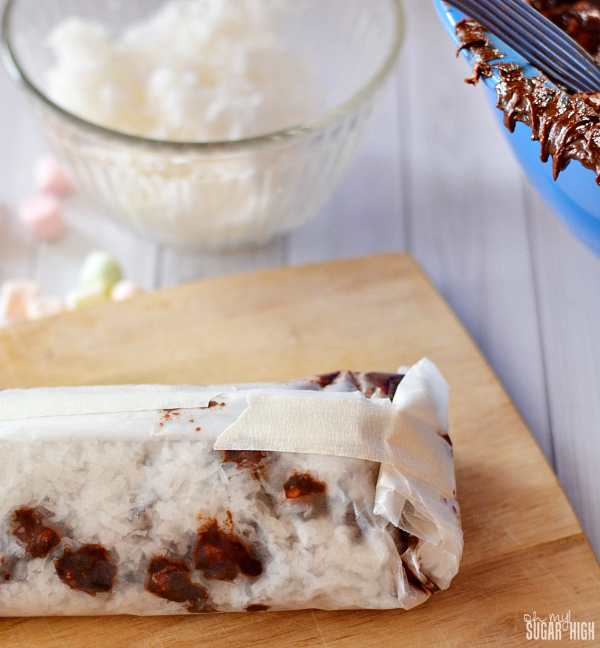 Pour half of the marshmallow chocolate mixture onto the prepared coconut on the waxed paper. 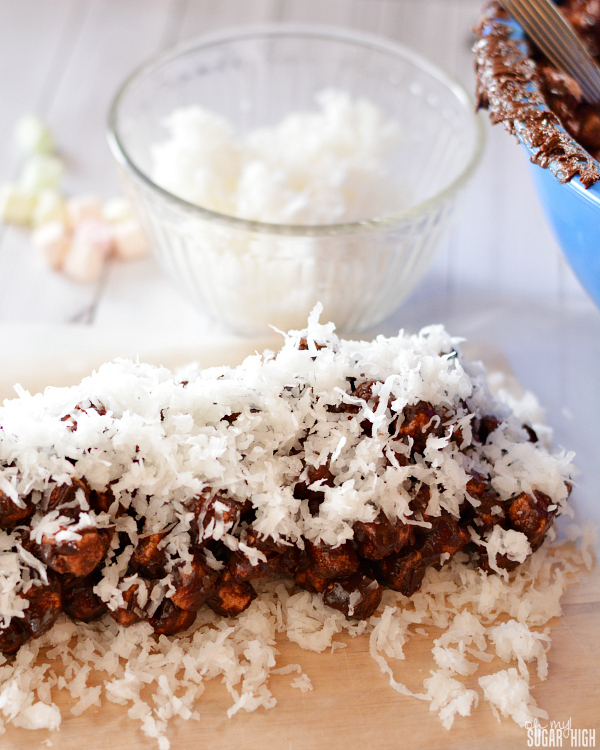 Sprinkle with coconut. Fold the waxed paper tightly around the marshmallow log. I match the long sides of the wax paper in the center of the log and roll it tightly. Secure with tape (for some reason I always use masking tape!) Repeat to make a second log. Unwrap, and slice to desired thickness. Usually around 1/2". Sometimes I leave my church windows long and other times I cut them in half to create a smaller, bite sized piece. Store these treats covered in the refrigerator until ready to serve. No matter how you serve your church windows, they are sure to please a crowd. Note: I would love to give proper attribution with this recipe, but because it is a Christmas classic, I’m not sure of the original copyright owner. If anyone knows, feel free to let me know so I can update this post.